This is the cutest! I missed attending a toy event up in NYC last month but a couple of the PR folks I’ve been in contact with over years sent me some goodies to check out what’s new and hot for the summer toy season. I’ll bring you guys reviews of some of my favorites over the next few weeks, including this: the My Fairy Garden by Playmonster. It’s a flower pot and toy all in one! 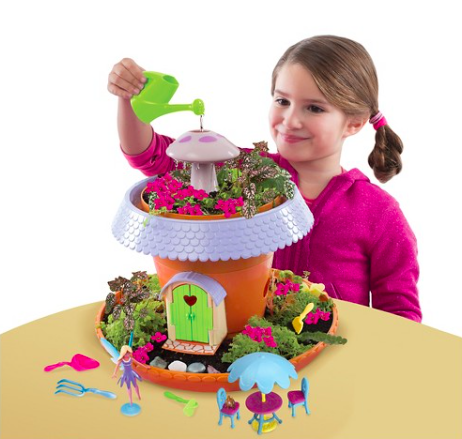 The top of the “garden” grows flowers via seeds that come in the toy set, which is complete with a Freya the fairy figure, her chipmunk friend and a bunch of gardening tools. I like this for a nice summer outdoor toy that girls can engage with in your back yard or deck. Target has it for $24.99 and if you spend $50 on Target.com right now you get a $10 gift card – that’s not hard to do!